What Makes A Good PR Person? Inquisitive, thinks expansively. Has a global and universal view of the world at the same time. Practically speaking, this means you’re a person open to ideas—whether ancient or new, within your realm of experience or beyond, and across the usual boundaries of age, race, culture, geography or language. We like to say about PR practice: You never know where your next good idea will come from. True enough, we are surprised each day about how much of our past experience—the things we’ve done, read, seen or been involved with, are somehow surprisingly relevant to the projects we’re working on now. It’s absolutely uncanny, and the good PR person never underestimates the value of his or her accumulated life experience to the job at hand. A good writer. We think a good PR person is, by definition, a good writer; someone who writes well and is on their way to becoming an excellent writer. By this, we don’t simply mean grammar and execution: what we mean most profoundly is that they understand “the voice” of the subject they’re writing about. They understand perceptions, feelings, and nuances related to the subject in a way that’s otherwise hard to explain. A good PR person is a good writer, on the lifelong journey of becoming an ever better writer. Honors the profession. A good PR person is self-regulating: He or she accepts that the profession, similar to journalism, is built around a bond of openness, mutuality and trust with the audience(s). They refuse to corrupt the process of communication. They accept the inherent responsibility of speaking truth to power, and vice versa. A fundamental principle of practice at our firm is that [responsible] “PR does not seek negative outcomes.” We’re not about trying to tear something down; we’re about raising something up—creating room for an alternative voice. So, these are some of our thoughts on what makes a good PR person (not exhaustive). We’d like to hear yours …Chime in. 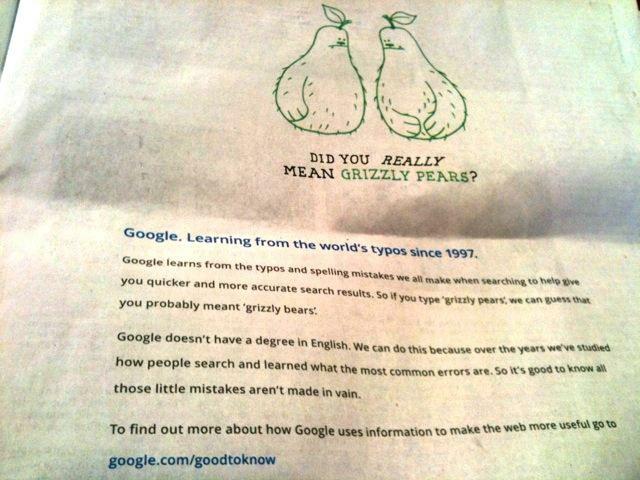 By the way, as we tweeted about earlier, here’s the latest ad from Google (the coffee stains are ours! ), presumably to offset concerns about privacy of information. Clever, but are they “winning”? You tell us.